1. The usage of whole living books. Living books helps a child to receive knowledge by their own work, looking for facts and information. 2. Using first hand resources. This is used when the child is digging for first hand information. This really gets kids into nature and hands on activities which is very important. Miss Charlotte believes that children should spend time every day outside with nature, even in bad weather. Charlotte also believed in children keeping a nature study journal or notebook to record what they saw and learned. She believed fully that spending time in nature brought you closer to God. 3. Narration. In Charlotte Mason education method narration is very important.Narration is when a child retells back in their own words either orally or written what happened. Charlotte believed that narration was the best way to acquire knowledge from books. Narration also helps a child to learn to form their own opinion and judgements on subjects they are learning about. This also is beneficial because the students learn to tell back what the author was feeling as well. 4. Copy Work. Miss Mason taught that when a child was about 6 years old they should begin copy work. This was a very common practice amongst colonel students. Charlotte felt that children should be copying quotes from great scholars for example instead of silly sentences. 5. Art & Music. Not only did Miss Charlotte believe that listening to good music and seeing good artwork was beneficial. She also believed that kids should learn about famous artists and their works. 6. Social Studies. Charlotte Mason believed that when we read biographies, original documents, history, and historical will introduce your family to both heroes and villains. 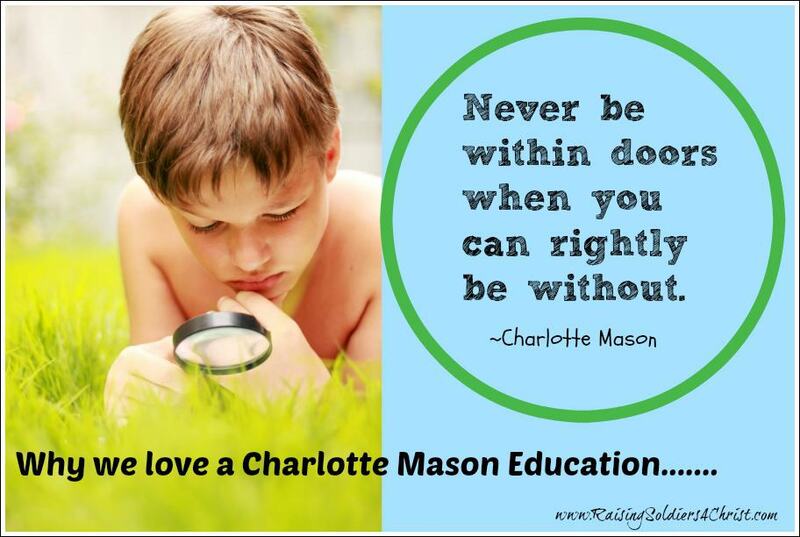 There is a lot of simplicity in the Charlotte Mason Education method. The afternoons of her scholars were left free so that the children would have time for other activities such as nature hikes, pursuing hobbies, music and dance lessons, handicrafts, plays, biking, work, chores, service, and other activities. There was no homework given so as they would have time as well. So who exactly is Charlotte Mason? Charlotte Mason was an educator in the late 1800’s in England. She felt that education should be a gentle art and that developing good habits is essential because once developed, they guide your life and determine your path. She taught that education is an atmosphere, a discipline and a life. She felt that children should not be isolated into a reading outdoors child-environment but that they should experience life as it is. Some of the main characteristics of a Charlotte Mason education include using living books, narration, short lessons, free afternoons without homework, nature study, and uplifting cultural studies such as music and art. Charlotte Mason taught in traditional schools, but her methods translate beautifully into homeschooling and are popular among homeschoolers. Previous Post: « Hurry! Time is RUNNING Out!! !